On September 21, 1777, a significant battle was fought by a heroic Continental force right here in MALVERN. Just after the serious defeat at Brandywine, Gen. Anthony Wayne camped here and prepared to attack the rear of British forces under Gen. Howe. 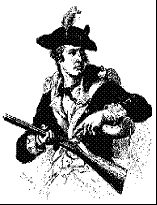 During the night the British forces attacked with muskets unloaded and bayonets fixed. Revealing their own position by firing their muskets, Wayne’s men were easy targets. Daybreak revealed a grim reality. At least fifty-three Americans were dead and scores were wounded. The graves of those fifty-three men are located to the east of the flag pole in the Paoli Memorial Park, the site of today’s Memorial Parade Activities. Unlike most of the ground where the American Revolution was fought, the 45 acre Paoli Battlefield is virtually unchanged! The Paoli Battlefield Preservation Fund, a non-profit corporation, continues to seek support to maintain the Battlefield property.